The mummies, either standing or lying down, are divided into gender, age and social categories. 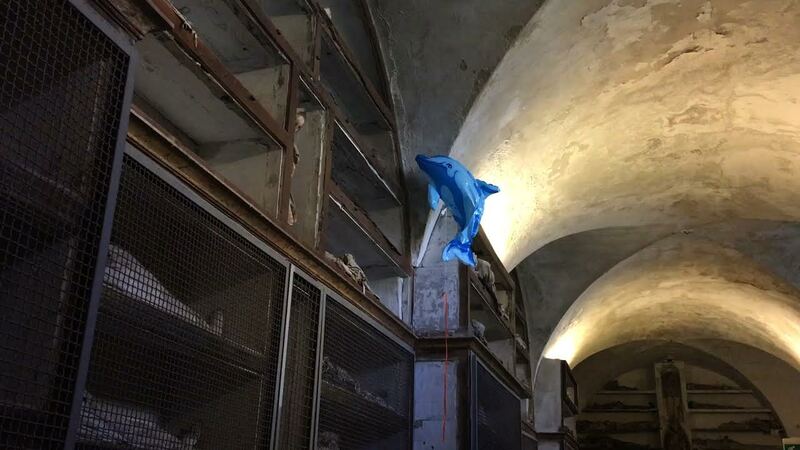 While visiting the children’s wing, Gordon came across an abandoned inﬂatable dolphin ﬂuttering freely among the corpses. Gordon has often focused in his art on the juxtaposition of doubles and opposites: here the macabre contrast between life and death, between the playful aspect of the inﬂatable dolphin and the dramatic nature of the context, is encapsulated in a few frames whose heavy pathos derives from their warning of the brevity of life, but also from the macabre and ironic presence of a toy that belongs more in an amusement park than a cemetery.